The Swiss company Victorinox has more than 125 years of development and production of multi-tools and knives, including the famous original Swiss Army knife. This versatile folding knife is equipped with a blade and a few additional tools, such as otverki, bottle opener, corkscrew, etc. 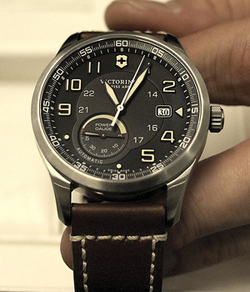 The new men’s watches Airboss Power Gauge from the Swiss company Victorinox. The model has LED back-stroke (in the “7:00”), as well as a window with the date (the “3:00”). The hands and hour markers on the black dial are covered with a greenish-white fluorescent compound Superluminova. Sapphire has a three-layer antiglare protection. Applied to the flange minute scale, and under the main hour markers Arabic numerals in the form of markup is 13 to 24 hours. 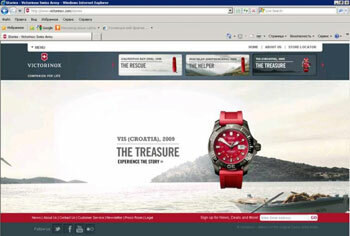 Victorinox presents a model wristwatch Victoria. This model is available in different colors and materials used. Sports Model Victoria well suited for men, women. Design clock combines the determination and femininity, elegance and sportiness. Seamless, smooth polished bracelet gently hugs the wrist. The design of the bracelet in this model plays a key role; together with the body it is integral that gives the watch a special effect. Making the dial has a “beam” structure. Hour markers are point inclusions and, in turn, are aesthetically integrated with “rays”. Watch company Victorinox Swiss Army reissued its iconic 1989 model, which started and hour epic Victorinox. Original model by Victorinox – a modern interpretation of the previous versions. It retained the basic elements and aesthetic features of military watches: simple and clear form, legible dial, the “military” hour markings, luminous hands, a nylon strap. However, the new “reading”, with a few accents, watches sports and have acquired urban characteristics, a very relevant modern demands of young people.